Published on January 15, 2015 in Daily Dirt and National. Closed Tags: Alaska, construction, construction industry, contractors, economy, employment, Louisiana, North Dakota, oil, oil & gas, oil & gas extraction, oil prices, Oklahoma, pipeline employmen, Texas, Wells Fargo, Wells Fargo Economics Group, Wyoming. Oil- and gas-related businesses are cutting capital budgets and implementing layoffs in the face of the continued slide in oil prices. The bulk of the burden is falling on just a handful of states. The ongoing fall in oil prices will hurt domestic producers squeeze their profits and reduce their capital spending and exploration efforts. Producers are not the only ones who will feel the squeeze. The decline in capital spending and exploration will also hurt support businesses, manufacturers of related equipment, and possibly spill over to firms that build pipelines, transport oil and sell the commodity. Weakness in the domestic oil and gas industry has contributed to a downward adjustment of our forecast for business fixed investment for the first quarter of 2015. The sharp pullback in oil- and gas-related investment and employment will largely be concentrated in energy producing states, while the benefits of cheaper gas will be more equitably divided among the entire nation. In dollar terms, Texas is likely to suffer the largest loss. 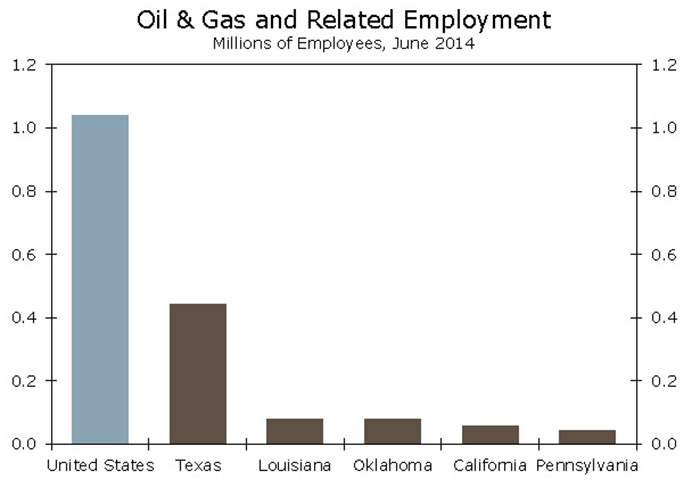 The Lone Star State has by far the largest number of workers in each of the oil- and gas-related industries. However, it does not have the highest concentration of those workers as the state is relatively large and diverse economically. In Texas, only 2.6 percent of workers are employed in oil and gas extraction, drilling oil and gas wells and support activities for oil and gas wells. By contrast, 6.0 percent of North Dakota’s workers are employed in those three industries, while 5.8 percent of workers in Wyoming are concentrated there. 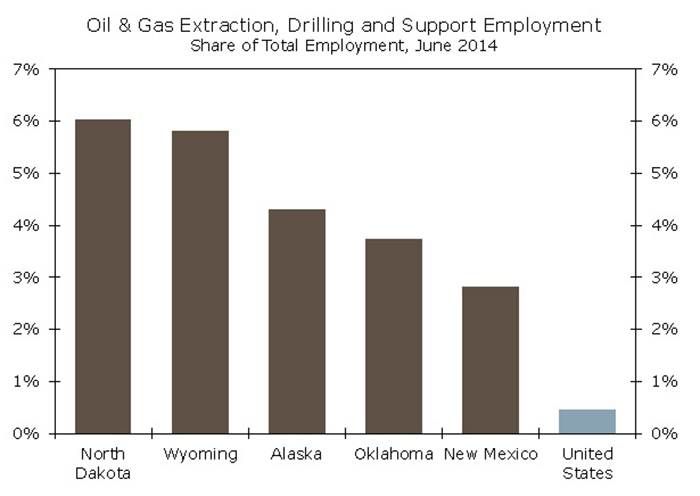 Moreover, Alaska, Oklahoma, New Mexico and Louisiana all have a higher concentration of oil and gas workers than Texas. Support for oil and gas operations has been the largest and the fastest growing oil-related industry in the U.S. by employment. As spending cuts become more evident in the data, this industry will significantly restrain job growth in many of these states. The pain of capital spending cuts will reach beyond those in the business of extracting oil. Oil and gas machinery manufacturers will feel the squeeze of reduced demand. Employment data on this industry are not available for several states, including Wyoming, North Dakota, Louisiana and Alaska; however, nearly 80 percent of all workers in the industry are employed in either Texas or Oklahoma. The construction of oil and gas pipelines, pipeline transportation and petroleum wholesalers could also be at risk, though cuts to these industries are unlikely to be severe if the momentum in oil production does not slow this year. Pipeline construction is most heavily concentrated in Wyoming and North Dakota, with a slightly smaller concentration in Louisiana. 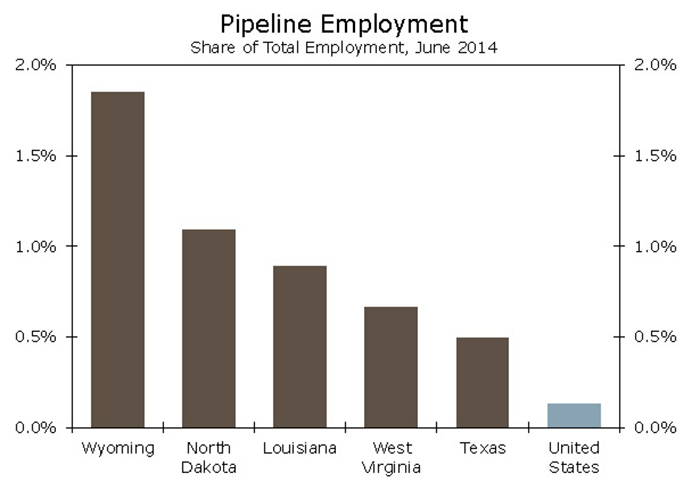 Wholesalers and pipeline transportation are relatively small employers, but still account for a sizable share of the workforce in Wyoming, North Dakota and Oklahoma. Published on July 3, 2010 in Digging for Dirt. Closed Tags: Alabama, bridges, construction, construction industry, economy, EPA, Green, Gulf of Mexico, Gulf Shores, infrastructure, Louisiana, oil spill, Texas. One of the dominant news items is the oil spill, which is beyond its third month. It has challenged scientists, environmentalists, the oil industry and the patience of not only this country but also the world. The extent of its damages cannot yet be measured. Just the other day I read a report that a scheduled bridge project for Minnesota has been delayed because of the oil spill. It’s predicating the need for additional environmental impact studies. People from Alabama’s Gulf Shores area are complaining because the clean up is restricted to beach surfaces and does not include the oil that gets buried by the tide hammering it into the sand. At this point the beach clean up is cosmetic. The problems become myriad because cleaning crews cannot work for long periods in the blistering hot sun with temperatures in the 100+ degree range. For every fifteen minutes they work they have to spend fifteen minutes cooling down and recuperating. By necessity and safety regulations, eight-hour workdays become four hours but the cost doesn’t decrease. Among the verbiage that has been expounded, written and spoken, is the demand that we become oil independent. This isn’t going to happen. Alternate fuel sources, while available simply can’t replace what we already have in place and let’s not forget the emerging countries that are just now becoming oil addicts. Kicking an addiction isn’t easy and can’t be done overnight. It takes time, understanding and support. Are alternate energy sources available? Certainly. They’re just not practical in today’s economic environment. How would you react if you were told that effective immediately you couldn’t use your car, you air conditioning or your electricity? You’d be paralyzed. As a society we’d no longer be able to function because we have become totally dependant on the things that energy provides. So, what do we do? We evolve, make the transition, adapt. We learn how to use hydrogen and an energy source; expand our use of solar and wind power; become less extravagant in our consumption of energy. In the late 70s the country experienced its first fuel shortage. Then we were driving 300, 400, and even 500+ horsepower cars that weighed several tons and drank gallons of gas. We were satisfied with fuel economy in the 10 – 15 mpg range because gas was only 32.9 cents a gallon for regular and 39.9 cents a gallon for premium. At that time more than 90% of the cars on the road were V-8s with rear-wheel drive. The country freaked out when gas prices shot to 99.9 cents a gallon and the auto industry responded by giving us 4-cylinder front wheel drive vehicles that delivered 25+ miles per gallon. The race was on, not the horsepower race that ran wild in the 60s and 70s but the fuel-efficiency race to deliver vehicles that got more than 30 miles per gallon. What happened? Vans, then SUVs. Everyone had to have one and the bigger the better so were back to the same level of fuel consumption – almost – as we were 70s. The only difference, we are driving more now then and we’re using more fuel. The point is that we started on a mission to become oil independent in the late 70s and early 80s and let ourselves get distracted, first by van – remember the van craze? You still see them. Then we went from vans to SUVs. Right, everyone needs four-wheel drive capabilities and four-wheeled behemoth to go to the grocery store, or church or run errands. Sure you do. Not many people are going to run out and trade their SUVs in on SmartCars, but you certainly can start curbing (pun intended) your trips to the store or whatever. Other things you can do is make certain that you follow the recommended maintenance practices outlined in your owners manual. (Yes you did get one with the vehicle when you bought it.) A properly maintained vehicle will dispense lower emissions into the atmosphere; give you better fuel mileage and longer vehicle life. Not only that, it is a positive step towards oil independence. In your homes, control your air conditioning or heating use as well as the use of electricity. This may seem trivial but if 300,000,000 people do a little, the result will be significant. If by the time you read this the oil spill has been stopped, that’s great but we should still work, doing our part, to achieve oil independence and kick the oil addiction. Maybe if the people who ever they are/were) from the late 70s had taught us the value of finding ways to cut and eventually eliminate oil consumption we wouldn’t be struggling with this same problem today – high energy consumption on the road, at home and with everything we do. Published on April 30, 2010 in Daily Dirt. Closed Tags: drilling rig, EPA, Louisiana, off shore, oil, oil spill. As part of the ongoing federal response to the BP oil spill in the Gulf of Mexico, EPA today established a website to inform the public about the spill’s impact on the environment and the health of nearby residents. The website – http://www.epa.gov/bpspill – will contain data from EPA’s ongoing air monitoring along with other information about the agency’s activities in the region. Also today, Administrator Jackson joined Department of Homeland Security Secretary Janet Napolitano and Interior Secretary Ken Salazar to tour the region. The Administrator will spend the next 36 hours visiting with community groups and meeting EPA staff responding to the spill. EPA has established air-monitoring stations along Plaquemines Parish on the Louisiana coast. EPA established those facilities to determine how oil set on fire in the gulf and oil that is reaching land is impacting air quality. EPA is monitoring levels of a number of chemicals potentially emitted by oil, including volatile organic compounds such as xylene, benzene and toluene. EPA has also deployed two Trace Atmospheric Gas Analyzers – mobile laboratories that collect and analyze air quality samples in real time – to monitor air quality in the region. EPA tested smoke from the controlled burn two days ago and found the Louisiana coast had not been affected because an off-shore breeze was blowing away from land and out to sea during that time. The agency will continue to collect and share data with the public, and will coordinate and share information with local health officials. In addition to monitoring air quality, EPA is also assessing the coastal waters affected by the spreading oil. EPA deployed our twin-engine aircraft to assist in the collection of air sampling data and photograph the spill and surrounding area. All of the data EPA collects will be posted to http://www.epa.gov/bpspill , along with frequently asked questions, fact sheets about potential health impacts of the spill, and links to more information on the spill and the government’s response.